← Hanamaru Kindergarten: anime review – the school for disproportionate kids! Canne’s anime review blog has just advanced to the second round of the Aniblog Tourney! As many of you might have already noticed, my match against Colony Drop was quite interesting and exciting (at least to me). In fact, it was almost exceptional. In this post, I’ll talk about the noteworthy facts and try to understand what really happened back then. So before I dive into several interesting details of the post, I would like to thank everyone for your kind support and, of course, your votes which carried me and this blog to the second round despite the extremely tough competitor. Thank you! The honest criticism from the readers and visitors can be both scary and encouraging. So far, the reactions had been generally (and surprisingly) positive. Several of the good responses came from closed friends and fellow bloggers like Yi, foshizze, Glo, Velore, zzeroparticle, Aorii, aquabluesweater, Kitsune, Mefloraine, Janette and many others. A good number of people, myself included, thought that my blog was decent. I think it’s a good sign that so far I have not received any extremely negative criticism…or maybe I didn’t look hard enough. Where did these 479 votes come from? New votes kept adding up and hardly slowed down for the entire race. Where did those people come from? 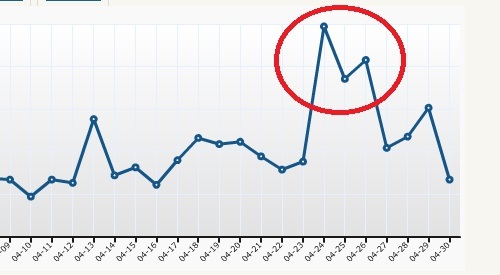 It was only in the last two days of the race that my blog started to take the lead. Based on the said interesting facts, I have been giving them some thoughts and came up with a few speculations that might explain what exactly happened. Colony Drop’s popularity drew large number of people into this particular match (Scamp had similar thought on this matter). But due to its radical style of writing, not everyone ended up voting for it and some even intentionally voted against it. 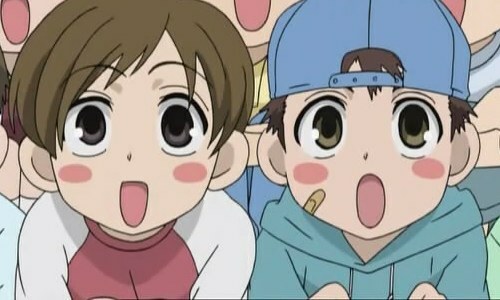 But then again, such popular entities like Fuzakenna and 2D teleidoscope didn’t generate similar effects. Under the assumption that most of fellow bloggers and regular aniblog readers had already given their votes in the first few days of the match, I suspected that my blog got several votes from outside visitors and non-bloggers. This might explain the late rapid growth of votes for my blog. Or is it possible that my blog is so popular and has tons of secret admirers hidden all over the blogsphere…I was just kidding! Ultimately, I think several factors contributed to the result of this match and surely, many people voted for me because I did something right. Despite all the doubts and questions, I was really happy and I did gain a lot of new friends and visitors during the course of the race. I am facing Wakaranai in the second round. I hope that I will continue to have your supports and for my new readers, if you like what I am doing, please vote for me! This entry was posted in Articles, Talks and tagged Aniblog Tourney. Bookmark the permalink. Dropping to my bluntness for a moment: I think a lot of this match came out to be Colony Drop vs. NOT Colony Drop, rather than how this blog is. Tbh my decision came easy once I noticed Colony Drop’s hating style, and comments sure tell me I’m not the only one. I admire your bluntness and you had the point. But I can never be like Eternal or other famous bloggers you had compared me to. This is my style(the balanced, non offensive style) and I won’t try to be like anybody else. Right now I still need lots of practice but I am sure my strength with be visible someday. I’m sure Aorii nailed it. People started voting when the danger of Colony Drop winning became real. Real enough that I had to weigh in and promote you. And sheesh, criticism. How about the LOATHING? Because that’s what Colony Drop evokes. I’d take criticsim any day. Umm, I never knew so many people hate CD that much. But then again, I have not given it a thorough read. GRATS! I’m glad this experience has been a positive one so far. People started twitter campaigns in order to get people to vote both for and against Colony Drop. It essentially came a for vs against Colony Drop. When you pulled ahead CD fans panicked and tried to garner votes. When the vote swung CD’s direction the opposite happened. That’s quite amazing actually. They were really afraid that CD would win. And I should pay more attention to people’s Tweets. Congratulations! I voted for you (must confess I never even looked at Colony Drop’s blog – eep! – probably should have at least looked at it, to be fair – oh well). Good luck going forward! I feel a lot of people may not have given the reviews a thorough read. I really think as reviews, they are well written, gives a good impression of what to expect for a series, and pays attention to the important aspects of a particular series/ anime. Anyways, some people seems to rarely have anything nice to say. Now I want to give you a big hug, thank you! Thanks! I get the feeling that the second round won’t be easy either. I knew you had it in you the whole time. I will not say congrats, because this is expected. I expect to face you at some point, and only after you beat me will I congratulate you…..
Who am I kidding I’m going to be out next round. Congrats! How come you have more confidence in me more than I do for myself? I think you won’t have much trouble winning the second round. Wow, that was dumbest reason to say something like ‘She asks to vote for the other blog!!!’. Like seriously, it was a good point that these kids in Hanamaru have no necks and look deformed, and he/she writes complaining that you didn’t like it? Lol. Not everyone is supposed to like moe/chibi characters. Apart from that, good match, it was really impressive that you actually won with that big gap between. It’s kind of fun as long as I don’t take it too seriously. 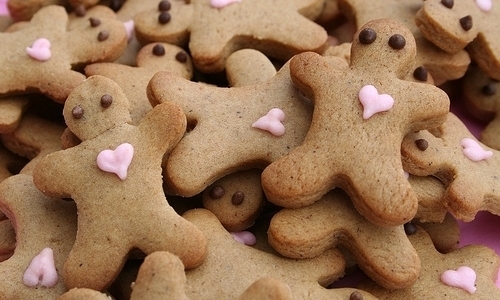 And don’t forget to take your cookies! Perhaps you should start your own twitter or facebook campaigns for the next round! I will definitely need a lot more support if I want to get pass the second round but pushing myself too hard is not a very good thing either. Finger-crossed you will go through a lot deeper and keep this run going. Butler, one of the mid-major, made it to the final of the College Basketball Championship this year so so can you! It will be interesting thought to see if as many as 480 votes in the next round as well. 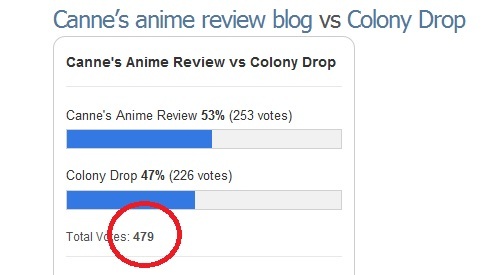 That really should show how popularly devisive Colony Drop really is. Congrats on making it to the next round XD Great to see your blog get more exposure, it’s surely been an exciting ride so far. Colony Drop, 90% of the time, tells it like it is.